Whether you’re looking for some dress up costumes for kids or Halloween costume ideas for your children, you’ll get inspiration here. We’ve compiled some great Halloween fancy dress costume ideas for girls and boys from babies and toddlers to tweens and teens. There are some absolutely gorgeous dinosaur Halloween costumes for toddlers available and what toddler doesn’t love dinosaurs? Let’s have a nice big Raawr! and look at some of the best dinosaur costumes for toddlers. Now as cool as dinosaur costumes are I was bowled over when I saw the dinosaur fossil costumes that have been released this year. When my daughter was a toddler one of these would have been her choice as it combines dinosaurs and skeletons – can you say love it in Dinosaur? Raawr! These gorgeous costumes are basically jumpsuits which means that your toddler will be comfortable in them (always a good thing to think about, nothing worse than a toddler who wants to take their costume off 5 mins after putting it on!) The black jumpsuits have feet in them and are screen printed to give them the look of fossils. They also come with a matching hood and mitts to keep them nice and snug while they’re trick or treating. The most popular dinosaur for some reason always seems to be the T-Rex which is why most toddler dinosaur costumes feature this big, tall member of the Jurasic period. Here are my favorite three T-Rex dinosaur costumes for toddlers, I can’t narrow it down any more than that! Aren’t they gorgeous? Can you choose just one T-Rex costume as your favorite? I keep going backwards and forwards between these three with a different favorite each time. Did you know that in Dinosaur the same word means ‘I love you’, ‘I’m hungry’ & ‘I eat you’? That word is Raawr! I’m not sure why we all love the T-Rex as they were one of the largest meat eating dinosaurs around so if they had co-existed when we were around we would have been avoiding them very quickly because if they said Raawr! to us it would be meaning ‘I eat you’ NOT ‘I love you’! If your child prefers the flying reptiles of the Jurassic period then this cute Pterodactyl costume will be perfect. I think this ‘flying dinosaur’ costume is really cute and I love the green and purple as I know a number of children who would pick the costume based on the colors alone! What about other dinosaurs? It’s okay I’m not finished we still have more one to go…. When I was a child I used to love the Stegosaurus the most, and not just because they ate plants, I just thought they looked cool. The big feet are actually shoe covers and I think they really pull the costume together, don’t you? Another popular dinosaur was the Triceraptops. This dinosaur was a large one with three horns, hence the ‘tri’ part in it’s name, but one the plus side he was a vegetarian so when he said Raawr! you didn’t have to run away! If your child likes the look of this giant dino with the scary face then why not get them this costume and a little green face paint as well – because what child doesn’t like some face paint on? Well that’s all of the dinosaur costumes I’ve found for your toddler, but if you wanted to make your own dinosaur costume for your toddler there are some great tutorials available. I hope you’ve enjoyed our jaunt to the Jurassic period for our toddler Halloween costume inspiration today. Zombies and boys seem to have been made for each other which is why I predict that some will want to wear these fun zombie costumes all the time and not just for Halloween or a fancy dress occasion etc. You can combine zombies with superheroes or music stars or more. Remember the saying that zombies were people too? This means that any costume you can think of can be turned into a zombie version of it, why even the sock monkey can become a zombie and that’s a scary thought for me! Let’s have a look at some of the fun, yet gruesome costume ideas that boys will love…. An Unlikely Zombie, But A Cool Costume! 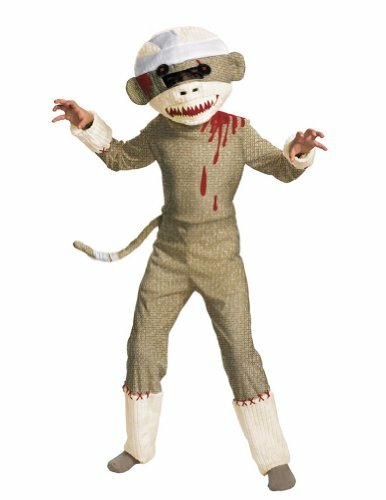 I love the look of this costume although it’s unlikely that a sock monkey would ever become a zombie, it’s still a cool idea. Since sock monkeys were first made out of actual socks in Victorian times they have been endeared by children around the world. Although the present day sock monkeys probably wouldn’t recognize their ancestors they have become something of a cult in modern society and they even have their own festival which may have been where someone dreamed up the idea of a zombie sock monkey too! 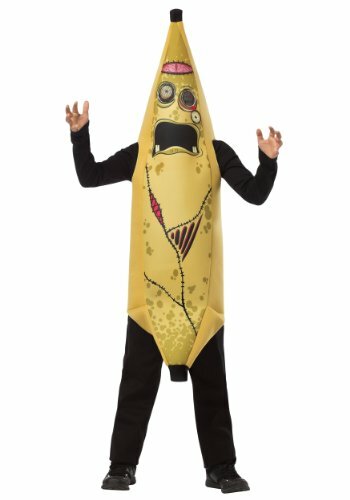 This child’s costume is basically made up of a jumpsuit with a detachable tail and a soft headpiece and it’s guaranteed to bring a smile to your child’s face, unless they were looking forward to adding some gruesome zombie make up to their faces in which case you might want to consider one of the other costumes available. A Popular Boys Costume with a Twist! Let your child go from ‘Arrrrhh me Hearties’ to mere grunts with this costume – it’s also a great way to get yourself ready for boy teendom I believe! 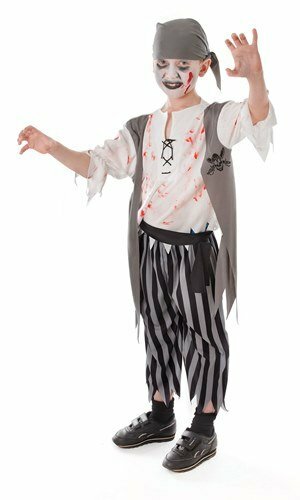 There are a few different zombie pirate costumes available as well as the one I’ve featured here, but another option is to use an old pirate costume if he has one. Last year’s costume may be a little short in the arms and/or legs, but once you rip them a little bit no one will notice they’ll just think that’s what a zombie pirate looks like! Be sure to add some dirt and fake blood and you have a perfect costume that didn’t cost you anything! If you do need to buy the costume then this one leaves the face clear so that you can hone your face painting skills or if you’re feeling very adventurous (and your child will stay still for longer than five minutes) you could even try using liquid latex to create some amazing ‘wounds’ for his face. I just go onto YouTube for inspiration, there are some amazing tutorials on there for both zombie face painting and using liquid latex to provide a cool zombie look. Not Even Ninja’s Can Escape the Zombie Apocalypse! Ninjas seem to be an eternally popular costumes for boys, but what about a ninja that wasn’t quite as invisible as he thought who managed to get trapped by zombies and was made one of the undead? I think this would make the costume even more appealing to some of the boys I know! 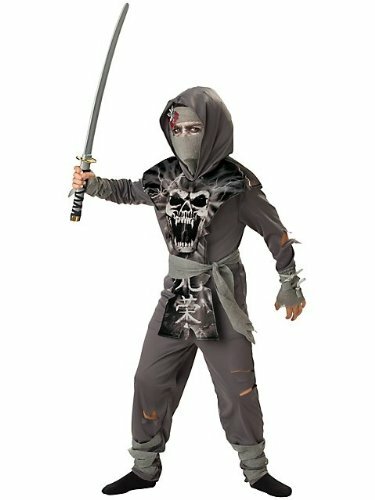 This zombie ninja costume includes a fabric mask which means all you need to do is use some black or grey face paint around his eyes to create the illusion of sunken eyes and make any other parts of the face that show through a greyish color – it certainly beats having to transform his whole face into something befitting a member of the undead! Unfortunately the costume doesn’t include the sword, which means you’ll have to buy that separately because you can’t really be a ninja without it can you? Of course you may already have a ninja sword in which case all you need is this four piece fancy dress outfit. The outfit includes a tunic, ninja belt tie, pants and a fabric face mask. From Superhero to a Member of the Undead! I have no idea how Batman was turned into a zombie, but I’m pretty sure that this is the end of Gotham City because without the dark knight himself how will they stop the undead from taking over the entire city. Next you’ll be seeing Commissioner Gordon, Robin and even Alfred as zombies ……. Superheroes are always a popular costume choice among boys, I know every time I see my youngest nephews they seem to be in different superhero costumes or if they’re not in costumes they’re sporting superhero t-shirts etc. I think the eldest of the brothers will be starting to look for something a little more ‘big boy’ by the time next Halloween comes so I’ll have to ask his mum whether or not he’s ‘discovered’ zombies yet! The mask that comes with this costume is truly gruesome and will save you having to weave your magic as far as face paint goes. It is definitely for older boys though as I imagine some of the younger ones would have nightmares just looking at the mask! 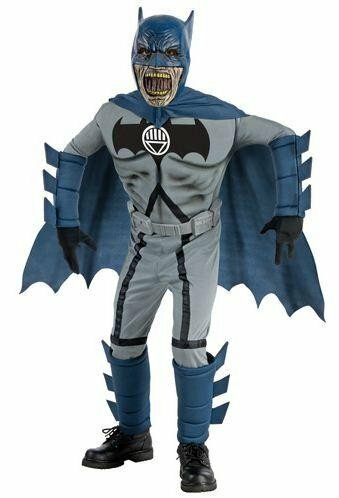 The costume also comes with the jumpsuit, but not the boots or gloves and I have to say that Batman is a much ‘tidier’ zombie than most, if it wasn’t for the mask you wouldn’t realize he was one of the undead! 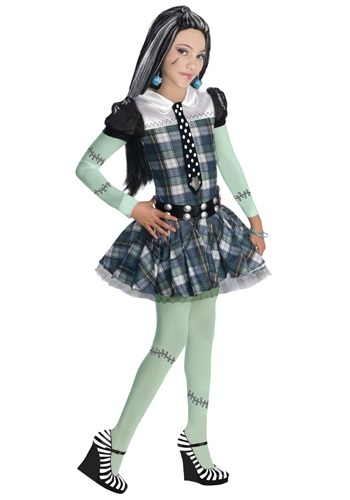 Looking for some cool Monster High costumes? You’ve come to the right place as we have some fangtastic costume ideas based on your favorite high school ghouls. Whether your favorite Monster High character is Frankie Stein or Lagoona Blue we have all of the costume ideas right here waiting for you. If you haven’t heard of Monster High then you don’t have any young girls in your life! Monster High started life as fashion dolls from Mattel, but they’ve evolved into so much more since then. There are Monster High books, television shows and they even have their own website! Basically Monster High Rules! The sixteen year old daughter of the Yeti this is a cool costume idea – I especially love the blue in the costume, after all Abbey’s favorite color is ice blue! Being the daughter of the Yeti it’s hardly surprising that Abbey’s costume should have fur on it as it’s all part of her personal style – it also helps to keep her warm when she’s showing off her snow boarding skills! 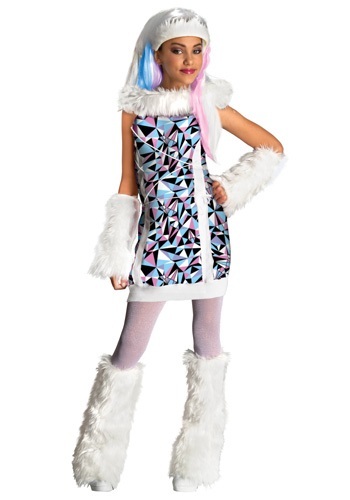 This official Monster High Abbey Bominable costume includes the kaleidoscope dress in black, pink, white and , of course, blue as well as the furry arm and leg warmers. Wig, make-up and shoes are not included with this costume, but you can buy them seperately. White tights are a great idea to wear with this costume and you can team them with any white shoes that you like because the attention is going to be on the white fur leg warmers when it comes to Abbey’s legs! You can actually purchase officially licensed Monster High make up kits including Abbey’s make-up along with her other classmates. I have to say that I saw this costume on not one, but three different young girls when I was at a Halloween event last year and it looked great! Two out of the three wore white tights while the other one had bare legs and I really think the white tights adds something to the whole look. 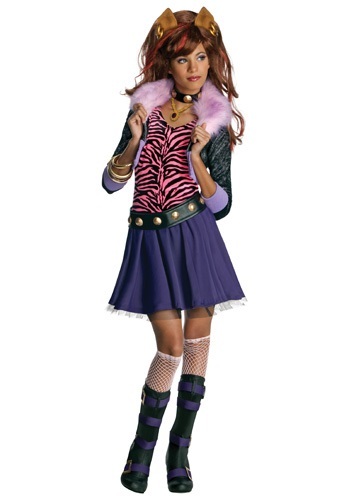 Clawdeen Wolf is the 15 year old daughter of a werewolf who knows she’s gorgeous and dresses with confidence. Included in this costume are the jacket, shirt, skirt, studded belt, studded choker and boot tops. Note – the wig, ears and make-up are not included. You can purchase an official Clawdeen Wolf wig which includes ears as well as Clawdeen’s official Monster High make-up. Let’s look at what is included in this costume though – first I love, love, love the purple and black boot tops. The great thing about getting boot tops is that your daughter can wear a comfy pair of black shoes of her own and just pop these on so that it looks like she’s wearing a fashionable pair of Clawdeen’s boots. The matching studded belt and choker is something that I can see your daughter adopting into her own wardrobe as part of a ‘rocking it with confidence’ look! Clawdeen’s black jacket has purple trim to match her cool purple skirt and you’ve got to love the black petticoat detailing around the bottom of the skirt – it’s enough to make you want to growl in delight! Daughter of a Mummy Cleo De Nile is the leader of the fearleading squad and a true Egyptian princess! Cleo loves gold as you can see in her costume, in fact it’s about the only thing that her and Clawdeen can agree on! She does rock bright blue though as evidenced with this costume that includes a sheer blue overshirt. Included in this Cleo De Nile costume is a shirt, leggings, belt and glovette in a matching gold ‘mummy-style’ material along with a gold arm band (very Egyptian). The blue overshirt is apparently attached to the gold shirt and really completes the outfit. Not included is the wig, make up shoes and jewelry that Cleo is also pictured wearing here. I would definitely let your daughter wear some gold bangles if she has any as it is just so Cleo De Nile! As I’ve stated previously you can purchase official Monster High make up for all of the students along with their individual wigs. It’s no surprise that Draculaura is Dracula’s daughter who loves to brighten up her life (and her wardrobe) with pink as you can see in her costume. Note – the wig and make up is not included. 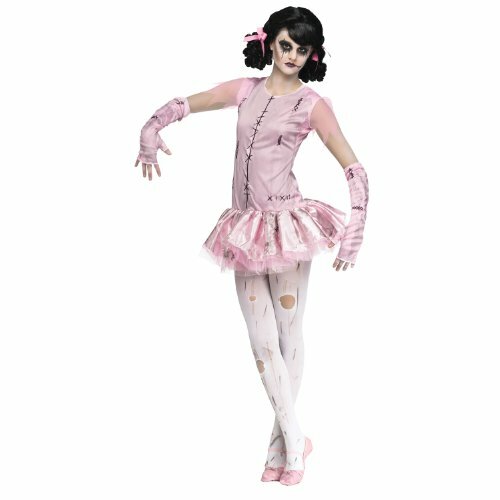 This whole costume really is fangtastic as Draculaura would say and if you wanted to add something extra to the outfit then find a black and pink frilly umbrella (or just a pink one). Draculaura often carries a frilly umbrella with her so that she can take an occasional walk in the sun. If you want more costume ideas for Draculaura then be sure to check out the page below which includes her fear squad costume, dot dead gorgeous dress and her sweet 1600 outfit as well as other ideas on creating your own costume based on your favorite Monster High vampire. The daughter of Frankenstein Frankie Stein is the envy of her friends with the absolute best body for fashion! Her love of black and white stripes is nicely demonstrated with her monsterley stylish hair. 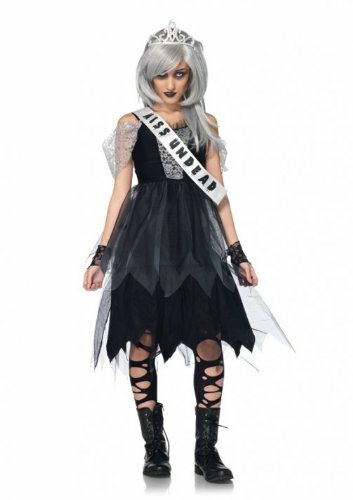 Unfortunately the wig is one of the things not included in this costume along with the shoes and jewelry, what is included however is the dress, tie, belt and leggings. The pretty plaid dress matches Frankie’s green skin really well and it has and attached stitch sleeve and polka dot tie with the Monster High logo on it. The leggings has the same stitch pattern as her sleeves and really ‘make’ the outfit as one of Frankie’s pet peeves is that her stitches sometimes come loose and limbs go flying though the air! 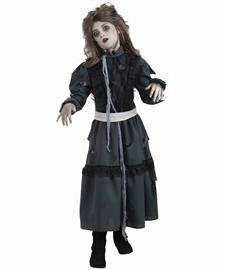 The stitch detail helps this Frankie Stein costume keep that illusion. Also included in this costume is a cool studded belt which just adds a rebel look to Frankie’s attire which a lot of young girls will also enjoy. Her costume leaves you in no doubt that her favorite color is red as it really does dominate this outfit! The white cat eye style of ‘nerd’ glasses is included in this Ghoulia Yelps costume along with her top, belt and pants. Note – Wig, make-up, necklace and sneakers are not included. I must admit I think it’s a shame that the sneakers aren’t included as they’re really cool. 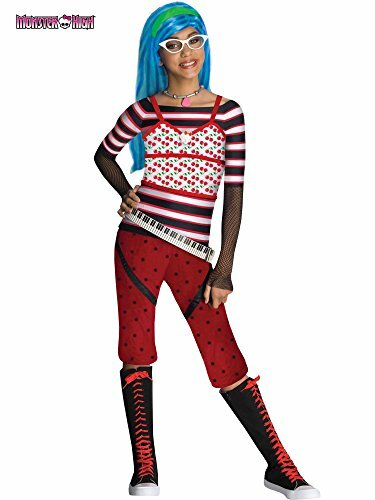 Let’s look at the costume in more detail – the pants are in Ghoulia’s favorite color of red with black dots over them which adds a cool dimension to her outfit. The belt is Ghoulia’s signature piano belt that you have to include with any of her outfits. The top is really cool giving the illusion that it’s a top over a top and you’ve got to love those fishnet/mesh style sleeves. Howleen is the baby sister of the Wolf family, but she certainly knows how to stand out from the crowd as you can see with her costume here. Having a popular big sister like Clawdeen and a big brother like Clawd it’s hardly surprising that Howleen wants to make her own mark in the world as I’m sure all younger siblings can sympathize with. 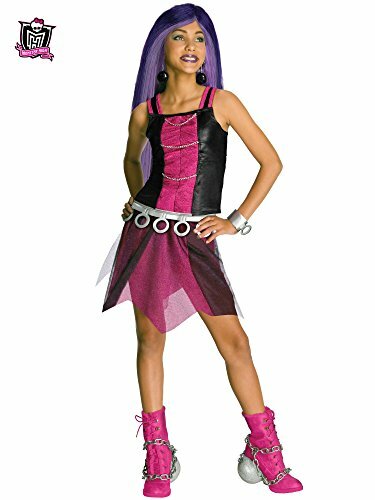 This officially licensed Monster High costume is based on Howleen’s outfit from the 13 wishes line and includes the very 80s inspired dress with attached jacket along with the belt, single glove and bright pink tights. All you need to do to complete the costume is to get a pair of black boots and Howleen’s wig. Howleen drives Clawdeen crazy when she raids her wardrobe without asking her, but I think this outfit is much better on her than her sister’s clothes as it adds a youthful, punk inspired edge which suits her really well. Jinafire is a dragon from Shanghai and is very fiery in temperment as you’d expect a dragon to be, she’s also very fashion conscious which is why she gets on so well with Skelita and Clawdeen. This costume certainly has a lot of far Eastern flair to it and it’s put together in a very fun way which is part of it’s appeal. The costume consists of the dress, tail (well she is a dragon so she has to have a tail) and belt. Unfortunately her amazing wig isn’t included, but can be brought separately and is available on my Monster High Wigs page. Daughter of a sea monster Lagoona Blue is really comfortable relaxing in baggies, tank top and floppies although with her looks she can rock a cute dress any day of the week..
Lagoona’s favorite color is ocean blue which is hardly a surprise as she loves the water as you can see from her costume which rather reminds me of a mermaid! I must admit I absolutely love Lagoona Blue’s costume, first let’s look at her top which is pink with black that looks like fish scales. The top has a a jacket that’s attached to it along with fins ……. well she is a daughter of the ocean! She is wearing a black skirt that has some cool leggings attached and I think these leggings really help to make the costume. They are a beautiful blue and are really sheer …… they also have fins attached. 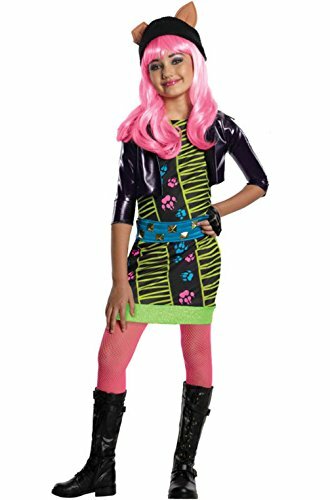 The wig, shoes and make up are not included with this costume, but the look of a Swim Team Captain at Monster High is definitely included!! Daughter of the Phantom of the Opera Operetta loves all music not just opera, but especially Elvis Presley. A perfectionist who loves her music Operetta certainly has plenty of her own style about her as you can see with her gorgeous costume. This licensed costume includes her jacket with attached shirt, pants, belt and her amazing eye mask which I am just a little in love with! Her jacket has spiderwebs over the shoulders which I think is to play homage to her pet, Memphis “Daddy O” Longlegs, who as the name would suggest is a spider! The belt has music notes over it as well as a spiderweb which all seems to be perfect for this diva of a ghoul. Her gorgeous red hair is fashioned in 1940s inspired victory rolls and unfortunately the wig isn’t included in the costume, nor are the shoes and socks although I’m sure you’d have suitable shoes and socks in your wardrobe to complete this relatively casual looking outfit. Hailing from Hexico Skelita is what’s known as a calaca (a skeleton used to celebrate the Day of the Dead), her whole family is made up of skeletons and her face is always made up to look like a sugar skull. This costume consists of gloves and tights with bones on them to imitate her skeletal figure along with a dress and belt. Her gorgeous black and marigold hair can be captured in the wig shown her, but unfortunately it isn’t included in the costume. It can be purchased separately if you like and I would personally recommend it as I think the wig is beautiful. Create the cool sugar skull detailing on Skelita’s face with the help of this video tutorial. Spectra rocks the hot pink and black in a way that my daughter loves – no guesses as to who she’d want to dress up as at a Monster High party! The daughter of ghosts Spectra loves to wear layers of silk with a touch of metal (like the belt this costume includes), that way she can float around like a very graceful ghost and make a little rattle just so that people know she’s there! 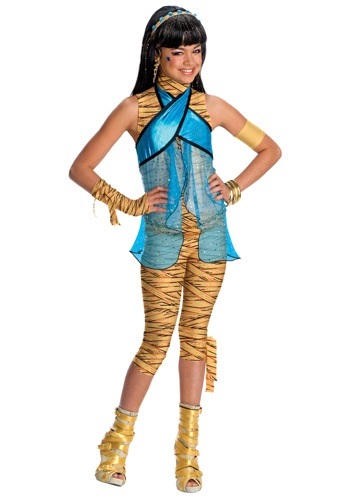 One thing that disappoints me with this costume is that the shoes and ball and chain are not included. I loved the look of them in the image so was upset to see that I’d have to try and create them myself. What is included in this Spectra costume is the top, skirt, belt and cuff which, luckily, are the things my daughter loves! The top is made up of faux leather and pink velveteen and has three silver chains on the front as a nice form of embellishment. The skirt is a matching one with a handkerchief hemline that girls love the look of. The belt and cuff both match and are important accessories to Spectra Vondergeist’s costume. Daughter of the Boogey Man Twyla is very shy and often misunderstood, I would call her an introvert in nature. Her blue-grey skin is topped off with an amazing looking pastel colored hair that reaches down to her hips. Her cascading locks are a pastel green in color with both blue and purple stripes running through it which makes her really stand out from the crowd. Her wardrobe includes a lot of pastel green, blue and black as these are the colors she loves to wear that also look great with her hair and skin tone. 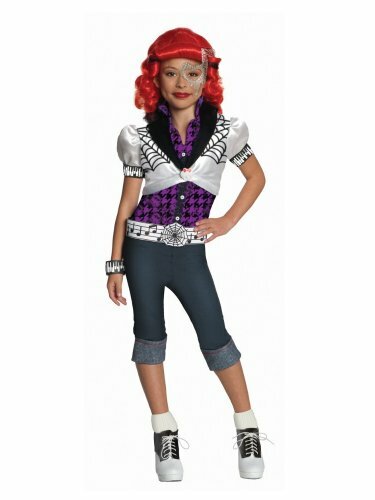 The official Monster High Twyla costume featured her includes both the dress and the tights – I would add a pair of silver gloves and the matching wig to really make the outfit ‘pop’.